Wall Street expects Facebook to deliver earnings of $US2.23 a share on revenue of $US12.54 billion. Forty-two out of 47 analysts rate the stock a buy. One analyst sees the stock at $US220 in a year. 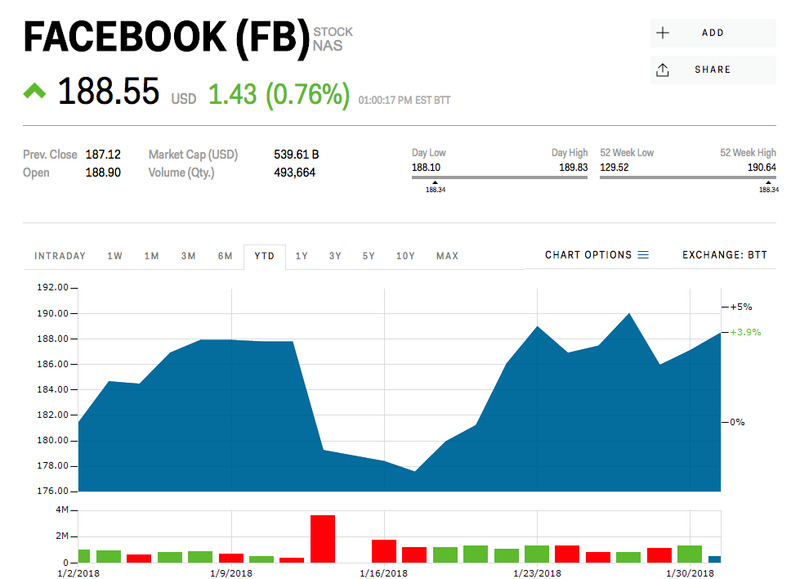 Facebook will report its fourth-quarter earnings after the market closes on Wednesday, with shares gaining ground ahead of the results. The stock trades up almost 1% ahead of results, hovering just below its all-time high. Analysts expect Facebook to earn $US2.23 a share on revenue of $US12.54 billion. Wall Street is bullish on the stock, with 42 analysts rating it a buy and just two rating it a sell. Victor Anthony, an analyst at Aegis Capital, wrote in a note to clients that “our checks have once again been bullish on spend on Facebook and Instagram, with advertisers citing an increase in pricing” by an estimated 30% year-over-year. He adds, “Instagram’s ad loads have increased and brand spend on Instagram Stories shot up in 4Q2017” as the platform continued to steal Snapchat users for its stories platform. Anthony has a price target of $US220 a share, 3.3% above of the consensus estimate of $US212.79. Read more about how millennials are trading Facebook stock.